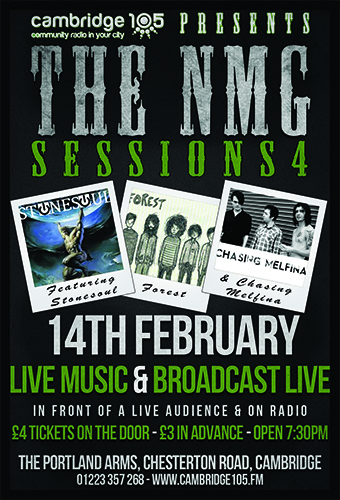 Cambridge 105 Presents The NMG Sessions 4. Featuring Stonesoul, Forest and Chasing Melfina. Live Music and broadcast live in front of a live audience and on radio, the doors open at 7:30pm on the 14th February, £4 on the door & £3 in advance at The Portland Arms, Chesterton Road, Cambridge.